ALTERNATIVES TO CYNICISM. A past that poisons the present. An ominous sense of the future. Life lived in despair of any significant purpose. Get what you can while you can. Exude cynicism. So the philosophies and spirit of our times would lead us to believe and behave. Is there a legitimate alternative to these ways that dominate American culture, drive consumerism, and determine personal & social behavior? Is there another way? FUTURE FAITH. Reflecting the perspective of George Herbert Mead and hope as it is portrayed in the Bible, Sociologist Tony Campolo writes: “What we are is significantly determined by the future… What we envision and hope for impinges on what we are in the present… What God promises for the future is a powerful influence in our lives… What is not yet is more important than what is… Christians do not concern themselves so much with where a person is coming from as where he or she is going.” (from A Reasonable Faith). MORE THAN A STAINED-GLASS WORD? Do I grasp this as the impact of Biblical hope in my life? Not very well. I'm not sure I've really given hope much thought. Certainly, I have not studied or developed it as a significant aspect of faith and life. Hope hasn't been much more than a stained-glass word that merely points to or complements other Christian graces. That's about to change. A MONTH OF HOPE. 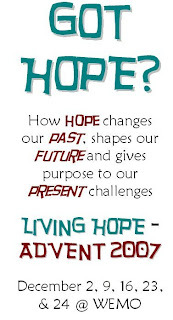 Throughout December, I'm exploring hope afresh. I know I'm supposed to spend one week on hope and then move on with the Lectionary-led progression in Advent. But if what Campolo suggests is true, Christians have been grossly underplaying this grace. We’ve never thought about the future like this. 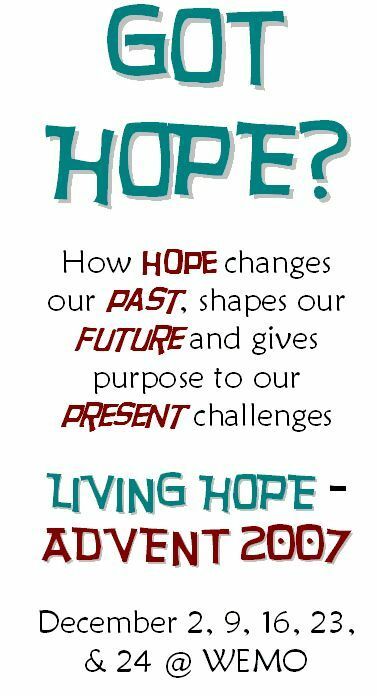 So, I’ve committed myself to stay with hope for the month to explore and share how hope changes our past, shapes our future and gives purpose to our present challenges. DAILY DOSES OF HOPE. I’ve decided to prepare Daily Doses of Hope and post them here and on our congregation’s website (http://www.westmorrisfm.org/). I intend these to be Word-centering Scriptures, reflections and exercises that build this grace into daily living. I'm not sure where all this will go, where it will take us, where we end. But the journey's on. Hope you'll join in.